In our continued discussion of which operating system is the best between Windows 8 and Mountain Lion. We will continue with which operating system has the better compatibility function and the better value. Because Windows 8 is Windows 7 with the Metro environment tacked on, it is compatible with all the software, hardware, and services you already have. Yes, some older PCs won’t run it, but that’s about resource requirements and lack of drivers for those that also don’t support Windows 7. OS X Mountain Lion of course runs only on Apple’s Macs, for which there is a smaller set of hardware and software available than for Windows. And Apple is ruthless in dropping technologies over time as it deems them problematic or limiting, such as removing RSS support in its email client and browser in Mountain Lion. The truth is that the everyday hardware people use — mice, keyboards, storage devices, printers, and displays — work on Macs, and the same is true for mainstay software such as Microsoft Office and Intuit QuickBooks. OS X is frequently underappreciated for its compatibility with corporate resources. It supports Microsoft’s SMB networking in addition to IP, it supports Open Directory and Active Directory, it supports corporate VPNs, and its email, calendar, task, and notes apps all support Exchange out of the box. The Safari browser is also much more compatible with the current and emerging HTML standards than Microsoft’s Internet Explorer. OS X Mountain Lion is clearly the better value, offering more capability and ease-of-use, the two factors that matter most to users, than Windows 8. And the psychic price of Windows 8’s split personality is quite high. Apple’s $20 upgrade price for Mountain Lion is hard to beat. Windows 8’s prices are unknown, but its various versions are expected to cost $100 or more for upgrades, and features such as DVD playback require the purchase of an extra-cost software pack that runs only on the costlier Windows 8 Pro version. For enterprises, OS X may have a higher cost for IT, at least initially, as staff must learn to manage and support the OS and the company must invest in tools to achieve the same level of management as the tools already purchased for Windows allow. Mac users tend to require less support than PC users, but that may be because most Mac users choose the platform and are thus more likely to be self-supporting in the first place. How does this all add up? 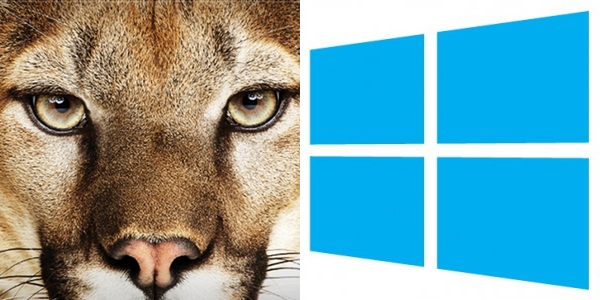 For Windows 8 they have an all around score of 7.6, and Mountain Lion has an all around score of 8.6. Clearly, OS X Mountain Lion is a better operating system than Windows 8. It’s better designed, more capable, and — contrary to many people’s beliefs — supportive of mainstream business security and management needs. But Windows supports a much wider universe of apps, so many people legitimately can only use a PC (or a Windows virtual machine on a Mac). With the misguided UI mismatch in Windows 8, many users will no doubt be looking for alternatives. If you’re in the market for a new PC, you should get one running Windows 7 while you still can (October 26 is when Windows 8 takes over, though Windows 7 will still be available for an unknown period after that on consumer PCs and for probably a few years more for enterprise customers). Or move to a Mac. You can read the full report of the scores here.